Everything was so great about hosts, facility, room was great and clean, verry friendly stuff, we will deffinetely come back again and will not search any other place to stay. The location is very good, near the sea, very nice place. The ground floor with the garden is good for families with children. 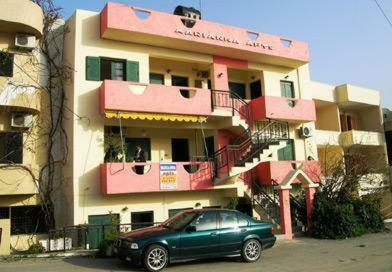 If you are looking for 5 star hotel with pools and Japanese massage – forget such a lovely place as Marianna apartments. 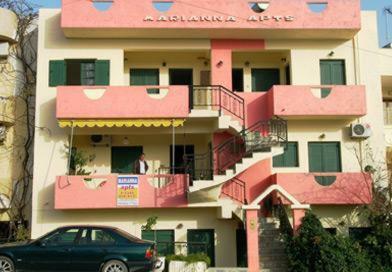 If you want a quiet place for the rest near the sea – come to Marianna apartments. We have spent there 10 days and we are totally satisfied! Our apartment had two balconies, so we always had possibility to hide from the sun and drink Crete’s coffee. You can find all necessary equipment in the apartment’s kitchen. 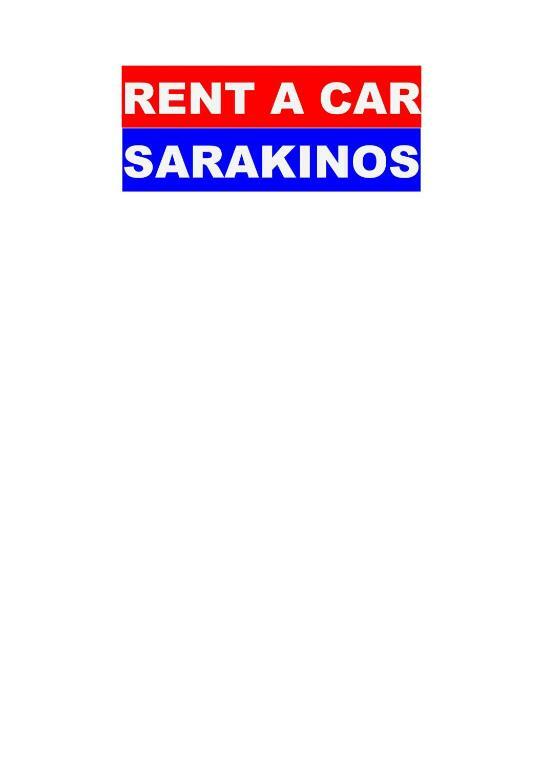 If you need anything else, you can ask extremely friendly owner – Mr.Sakis. 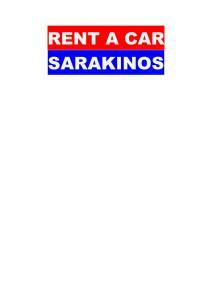 If you want to visit other places in Crete Mr. Sakis could rent you a car for very reasonable price. You may also ask him for a transfer from/to airport. So, I do advise to stay at Marianna apartments and I’m going to come here next year. The location is perfect. 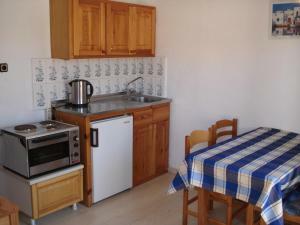 Very close to the beach, restourants, stores, pharmacy. Big free parking is in front of the property. Sea view for the thirdth floor, garden available for the ground rooms. Calm place. The hosts were great. We originally booked an apartment a 2 bedroom apartment for 4. The other couple had to cancel and we were stuck with a larger place, the hosts offered us a discount on the published rate since they couldn't put us in a smaller apartment. Номер на 3 этаже, балкон с видом на прибрежные скалы, море и крыши домов. Небольшая кухня, душевая и спальня, балкон ок 9 кв. м. На кухне есть всё необходимое, в шкафу спальной есть запасные подушки и одеяла. Утром завтракали на кухне, с видом на горы. На балконе удобно загорать до 11 часов.. Мебель - скромная. Тараканов не видели. До песчаного пляжа идти метров 200. У владельца апартаментов брали в прокат машину. Окрестности весьма приятны для пробежек и прогулок. Такси аэропорт 30-40 евро, под окнами кухни - остановка автобуса. Plaja este foarte aproape de apartament, la fel și supermarket-urile și magazinele de suveniruri. Apartamentul include bucătărie echipată: plită electrică, tigăi, oale, tacâmuri și veselă. De asemenea, are un balcon mare, cu priveliște frumoasă spre mare. Just 250 feet from the sandy beach and quietly located near the center of Agia Pelagia, the family-run Marianna Apartments provide spacious, self-catered accommodations with free WiFi and balconies or terrace. It features a garden with BBQ facilities. At the Marianna Apartments, you have the privilege of private balconies offering stunning scenery of the mountains and sea. Each air-conditioned unit comes with a TV and a kitchenette with cooking hobs, microwave and electric kettle. A private bathroom with hairdryer is included. Agia Pelagia has a variety of supermarkets, shops, fish taverns and cafes. Staff at the front desk can provide useful info on the surrounding area, the places of interest and places to eat. The property can also provide discounted car rentals. The village provides an ideal position for excursions with the highway only 1.9 mi away. Heraklion City is 12 mi away. 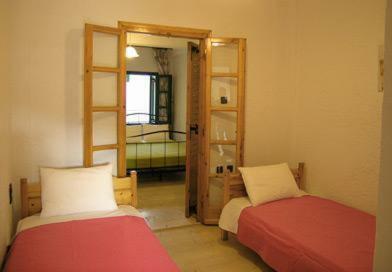 뀐 Located in the top-rated area in Agia Pelagia, this property has an excellent location score of 8.9! When would you like to stay at Marianna Apartments? 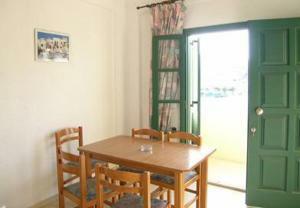 Offering Cretan Sea views, this apartment features free WiFi and 2 balconies. It has a TV and a kitchenette with cooking hobs. Opening to 2 balconies, this apartment comes with free WiFi. Offering 2 separate bedrooms, this apartment opens to 2 balconies. Free WiFi is available. 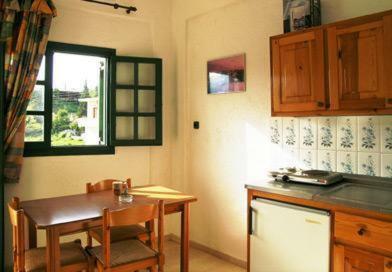 With direct access to the garden, this apartment is located on the ground floor. 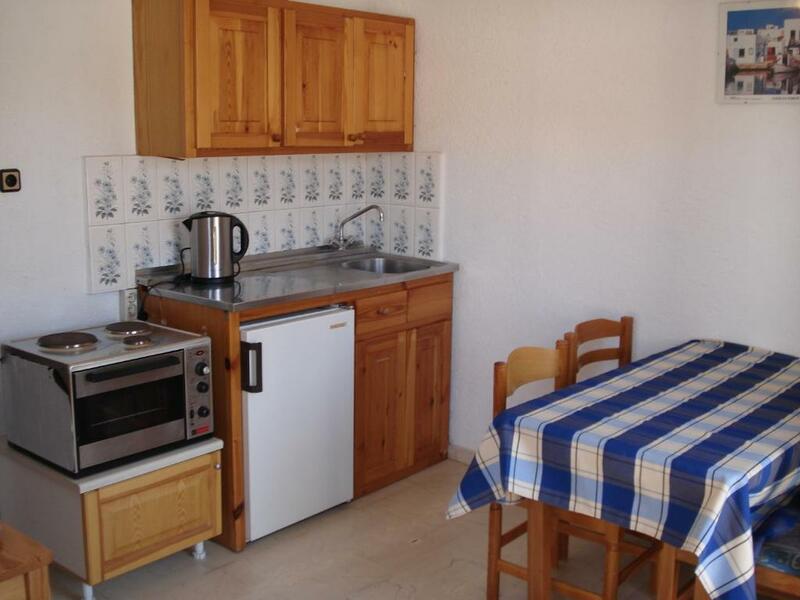 It has a kitchenette with a mini fridge and a mini oven with cooking hobs. A TV and free WiFi are provided. Opening to a furnished terrace or balcony, this air-conditioned apartment features 2 bedrooms, a kitchen and a private bathroom with shower. The location of Marianna Apartments is special because it is a combination of a quiet neighborhood which is only a 2 minute walk away from the main beach and all the shops,cafes and restaurants of Agia Pelagia. 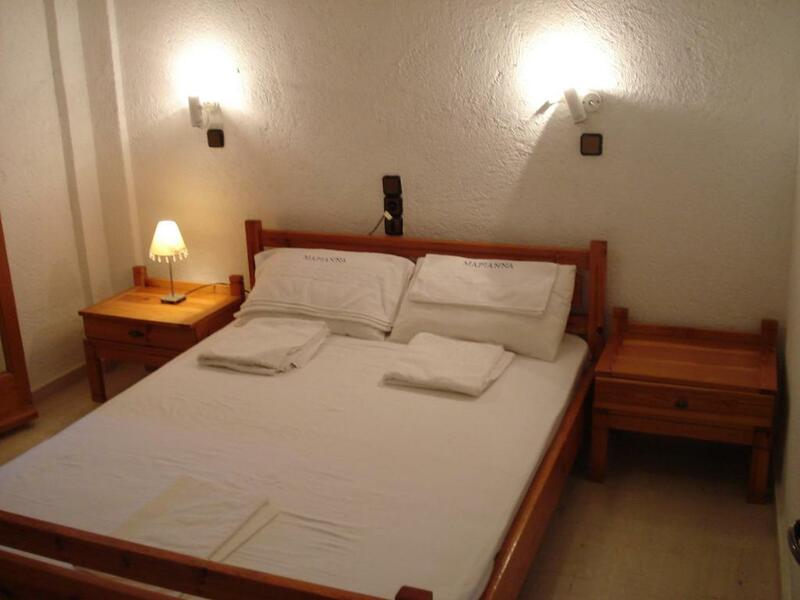 Furthermore, two-bedroom apartments can be provided which make accommodation comfortable for families or for groups of friends up to 5 persons. 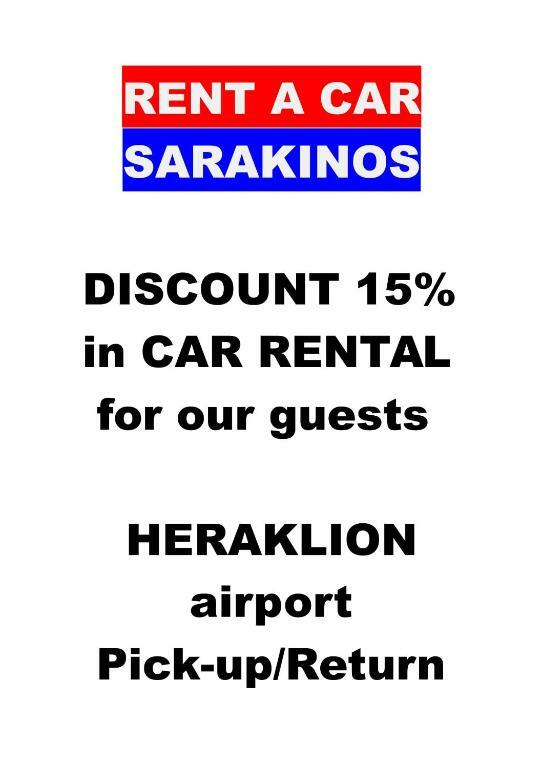 Additionally, we rent cars (Sarakinos Car Rentals in Agia Pelagia) at discount prices for our guests,delivery to Heraklion airport/ city is possible. We like to interact with our guests and to get to know different cultures form around the world. The neighborhood is the most comfortable and convenient neighborhood in Agia Pelagia. All shops,cafes and restaurants are within a 2 minute walk, a supermarket and a butcher's shop are found only 30 meters away and the main sandy beach is a 2 minute walk as well. It has an open space municipal free parking where the guests can park their cars just outside the apartment. It also gives you a nice feeling of open space, fresh air breeze. House Rules Marianna Apartments takes special requests – add in the next step! Please inform Marianna Apartments of your expected arrival time in advance. You can use the Special Requests box when booking, or contact the property directly using the contact details in your confirmation. The bathroom was below my expectations and usually no hot water in the evenings. It would be easier for me if I could pay with credit card in some way. The bathroom was too small. I think this place is great for travelling on a budget or with a small family. The bad thing were huge coacroges that we found every day in the apartment. Not very good cleaning service.